Since 1969 this firm has successfully completed over 450 designs for pleasure, commercial, sail and power. Known for designs such as the Delta Marine “Zopolite” class, “Onika” and “Princes Gloria” and the Northern Marine's “Sprit of Zopolite” designs, Seaton was working on Trawler designs before the word was even coined. Based in Florida and Seattle probably works on a wider assortment of boat types than most other design offices. Web Site Snapshot: If available, above is a snapshot of the Seaton Design web site at http://seatondesign.com as it appeared when this site was added to the directory or last verified. 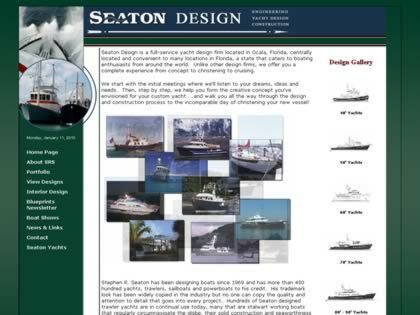 Please Note that Boat Design Net has no involvement with the above web site; all content and images depicted in the above thumbnail are the property and copyright of Seaton Design unless otherwise noted on that site. Description: Since 1969 this firm has successfully completed over 450 designs for pleasure, commercial, sail and power. Known for designs such as the Delta Marine “Zopolite” class, “Onika” and “Princes Gloria” and the Northern Marine's “Sprit of Zopolite” designs, Seaton was working on Trawler designs before the word was even coined. Based in Florida and Seattle probably works on a wider assortment of boat types than most other design offices.